The City By The Bay may be an oft-used phrase to describe San Francisco, but it can just as easily apply to the wondrous world of Harbor Springs, Michigan. A tiny town of less than two square miles, Harbor Springs has been the summer home for generations of visitors thanks to its seasonal sunsets, its amicable atmosphere, and its delectable downtown. With a year-round population of about 1,000 people, the city and its outskirts swell as the weather warms as people flock to the delights of the area. You can find award-winning golf courses, a beautiful harbor to dock and launch your boat, and picture-perfect beaches. Kayak to your heart’s content on the crystal-blue water or hike local trails to enjoy the flora and fauna. In July, experience the annual 4th of July festival and art fair. There’s a scenic 51-mile bike ride to Mackinac Island in May. And who wouldn’t miss the Scrabble Scramble, in which teams compete to build the highest-scoring Scrabble board! While summer’s the season to visit, don’t sleep on winter and fall. For the people who like powder, there are two ski resorts nearby and plenty of opportunities for cross-country action. In the fall, the M-119 Tunnel of Trees is a remarkable trek through a cornucopia of vibrant colors everyone should experience once. Of course, you can experience the greatness of Harbor Springs by visiting the city, but wouldn’t it be fun to have a home here? Discerning buyers will love the lakefront properties, all of which are custom-built and many of which have been remodeled in recent years. Take a tour of 4-bed/7-bath palace with views of the water out of nearly every bedroom. Or scale back a bit and live close to downtown in a more modest 3-bed/3-bath house that’s a nice walk from the beach. Either way, you’ll have a place to call yours in one of the most beautiful cities in Northern Michigan. Having a home here would also make you a part of a tiny piece of history. Harbor Springs was a playground for families like the Fords and Wrigleys and was called the “Naples of the North” by the late 1920s. In the 1960s, national musical acts made stops in Harbor Springs; the Beach Boys, Roy Orbison, the Four Tops, and Bob Seger played shows at a venue called Club Ponytail. That club is now gone, but downtown Harbor Springs is a land of plenty. With unique restaurants, wine-tasting rooms, eccentric shops, and a small-town atmosphere that makes summer nights feel magical, the district has something for everyone. Year-round residents with children can take advantage of the award-winning school district. 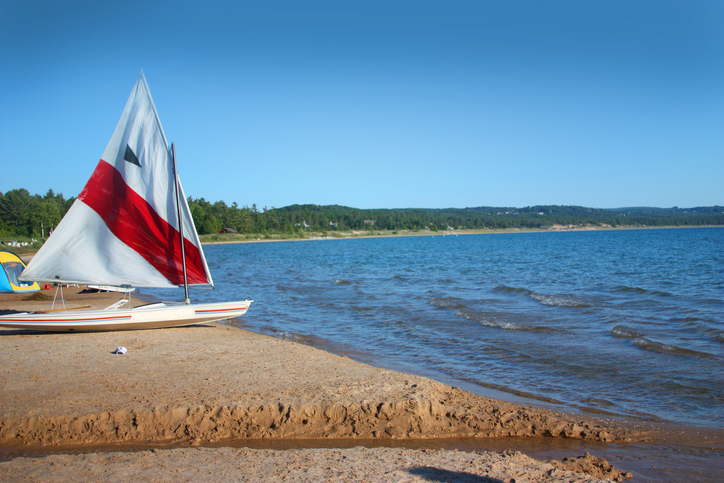 With that wonderful Up North feel, so many ways to enjoy all four seasons, and gorgeous views of the bay at every turn, isn’t Harbor Springs the next place you should call home?